Platforms is one the most interesting trends in the modern enterprise software development. Existing engineering software platforms are trailing long list of problems. One of the questions today what technology or product can provide a foundation for future engineering platforms. Read more in my blog about this. The development of cloud CAD systems is an important element in the puzzle of future engineering platform development. Although cloud CAD is focusing on the design innovation, the reality of modern cloud environments is setting up a different magnitude of challenges in data management. 20 years ago CAD developers left behind data management and focused on design, parts, assemblies and features. This is not an option in modern environment. To operate in current global environment, cloud CAD systems should solve the many data management problem at first place. It means to manage documents, parts, versions, design lifecycle processes and many other related topics. I outlined it in some of my earlier articles here and here – Why cloud CAD is closer to solve some PLM problems than you might think. An interesting part of Onshape platform is ‘document’. Although you might think about Onshape document as a kind of CAD assembly, it would not be accurate assumption. 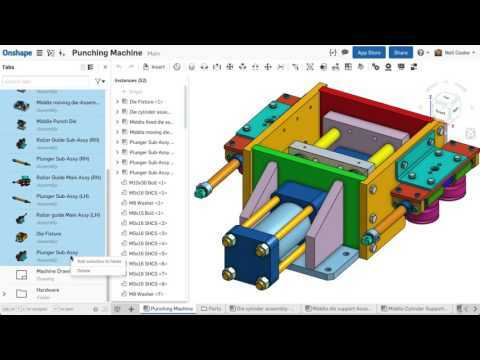 Onshape document is a container that can hold variety of information and data – parts, assemblies, drawings, imported geometry, applications developed by other partners, etc. From that standpoint, you can think about Onshape document as a project container of sort helping you to organize information. Folders can introduce an additional level of granularity and, at the same time, use a traditional paradigm of data structures CAD users are familiar with for many years.